I think that President Granger had no choice in the matter of the former Minister of Health. He gave it time, and resisted serious pressure to jettison the embattled minister. It is why I commend him for taking the action he did recently. Now for some more details as to how I read these developments. For starters, the former health boss would have been ushered out earlier, more abruptly, and very signally. But the man is a longstanding stalwart, who was just returned as party Vice Chairman in the midst of crisis and snafus. If that was not a vote of confidence, then I do not know what is. Additionally, the comrade represents very pivotal areas; thus any move at ouster-outright or otherwise-had to be conducted very gingerly, and with a great degree of sensitivity. This is realpolitik, Guyanese style. Even though he was at the helm of where he was, and with due cognizance to the constituency and area he represents, matters could not have remain unaddressed indefinitely. This was not an option; hence the plug was pulled. Now, this brings to the new minister, Ms. Volda Lawrence. As the spotlight centers on her, she has a number of things going for her. The president trusts her, and knows that he can rely upon her to oversee, move things along, and deliver at Public Health. Further, Minister Lawrence has earned a reputation (deserving) of being one of the few competent hands around in the ministerial pantheon. And as in the corporate world, bright stars are usually pressed with more heaven to illuminate. In others words, she is being challenged to do even more and to do so better. I think she will do well in this most sensitive and crucial of portfolios. Remember: the people must not be made to suffer. In terms of the elevation of Minister Amna Ally, I see this as another instance of the leader calling upon one of his handful of trusted and dedicated to rise to the occasion, as he has every confidence in her abilities. He also has her back, and is confident that she will not fail him. It should be noted that both the Health and Social Protection portfolios are grass-roots grounded or citizen centric. The people must feel that they count, and they are a ton of them. Moreover, I believe that the president wanted her, all things considered, outside the still undefined, unknown, and unfurling Social Cohesion shadow. And shadow it is. She, too, should deliver. And somewhere in all of this, I see the chief minister sending a message to the pedestrian ministers: watch out! Step up! Or you will be shipped out. Shipped not up or down, but o-u-t.
Last, as to the new minister of Social Cohesion, I do not envy the man. I do not believe anyone in Guyana would wish this job on their worst enemy. 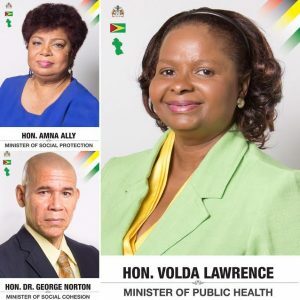 I hasten to state that I do not think that Dr. Norton is being set up to fail; only that he has a second lease on ministerial life and it is a thorny thankless lease. I must say that he will have his head and hands full. I did hear that a program is about to be unveiled at his new place of occupation. If so, then all he has to do is sit back and let the vessel stay on autopilot. Why try to prove how smart or powerful one is…? Best wishes all around.